Round stool seat (Ø34 cm) well-cushioned, classic seat providing excellent sitting comfort. Foot-operated height adjustment is advantageous for adjusting the height of the seat whilst keeping hands free. Brake loaded double castors (50 mm) brake the chair when there is weight load on the chair, thereby creating a stable and safe workplace. These castors are suitable for use with sit-stand desks, where it is important that the chair stands completely still. Brake unloaded double castors (50 mm). These castors only move if there is weight load on the chair. Brake unloaded castors are particularly useful for movement whilst seated. They also fulfil the requirement for the chair to stand completely still when the user gets up. Double castors (75 mm) are soft castors, which are best suited to hard floors such as hardwood and tiles. Extra large castors are an advantage on uneven floors, as large castors are better able to scale small obstacles. Double castors (50 mm) are soft castors, which are best suited to hard floors such as hardwood and tiles. Double castors (50 mm) are hard castors, which are best suited to floors with carpets. Double castors with click brakes (75 mm), are soft tread castors and are intended for use on hard floors such as hardwood and tiles. Click brakes are beneficial if you need to lock the castors so the chair cannot roll away. Friction brake castors (50 mm) have resistance in the castors, so the castors roll slowly and chair does not roll away when you sit on it. The chair can therefore support the user when sitting/standing. 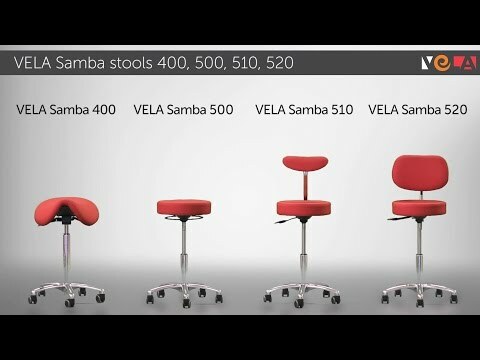 Brake loaded castors are particularly suitable for sit-stand chairs and stools for exercises, such as the VELA Samba 410. Slipshoes are fixed and stable feet that aredesigned for all types of floors and carpets. This type of foot is particularly advantageous in a sit-stand chairs that will not have to be moved around. Slipshoes provide a completely steady and stable chair. Phoenix is a quality fabric from Camira in 100% Polyester. Abrasion 100,000 Martindale. It has a very good abrasion resistance and it is breathable and very comfortably. The following colours are standard colours. However, we can provide all the colours that you see on the supplier's website. There may be an extra charge and longer delivery by selecting an other upholstery than standard. Clean with a clean, damp cloth, possibly added with a ph neutral soap. Clean with a clean, damp cloth, possibly with a ph neutral soap. You can also use disinfectant and alcohol cleaning. Comfort + is a quality fabrics from Gabriel in 88% polyester and 12% polyurethane. Abrasion 150,000 Martindale. It has a great resistance to abrasion and dirt resistant and water- and oil-repellent. Compound is a durable synthetic leather from Kvadrat made from 100% polyurethane. Abrasion Resistance is 100,000 Martindale. It has a good breathability, so the seat does not feel hot when sitting for long periods of time. Additionally, it has a good friction so you do not feel as if you are slipping on the fabric and it is water and oil resistant and easy cleaning. Clean with a clean, damp cloth, possibly added a ph neutral soap. You can also use disinfectant and alcohol cleaning.